The Green Man Pub & Restaurant, the best entertainment in the kingdom and joined with top singers and entertainers from the west in jazz, fusion or exciting variety shows on your special occasions or any event that you need as well as wedding ceremonies, we have a medieval mound at the rear of gardens which conforms to the most ancient matrimonial rituals. So at The Green Man Pub & Restaurant can arrange the whole event for you. We offer a fabulous menu at reasonable prices. The pub serves the essence of each season’s harvest with meat selected for perfection and the freshest vegetables bought overnight. Every week we serve the definitive “Sunday Roast” and every Friday night we serve Britain’s national dish as curry in British style naturally. 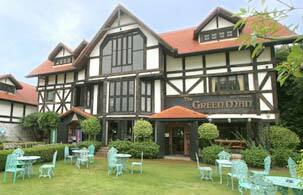 Moreover, The Green Man Pub & Restaurant also offer a wine cellar, large screen television and cigar divan. The Green Man has a custom built humidor to ensure our collection of Cuban Cigars then rest and mature in a perfect environment. In the pub there is an area for home of family fun on three and a half acres of beautifully landscaped garden, including a supervised playground, games & competitions, heap of toys and books, fancy dress and special children’s menu. Special promotion for dining at The Green Man Pub & Restaurant, we can arrange to pick you up from your home or hotel, just call (076) 281 445.